Life is full of shortcuts but those typically don’t work out well for anyone. Well that’s not the case with SOLIDWORKS shortcuts. There are many places to use shortcuts in parts and sketches. Think about how you create a model in SOLIDWORKS. You choose a sketch plane, start a sketch, find a sketch entity to use, add some dimensions, then extrude that sketch into a feature. You do this over and over again until the model is created. But during that process are you being as efficient as you can be? Are you using any SOLIDWORKS shortcuts? Well I hope you are. When I’m teaching, I emphasis SOLIDWORKS shortcuts. I say they really will help get your design done quicker but I never really had any data to put behind it. So I figured that I would model the same part 2 different ways. One way I would model using my typical shortcuts and the other would be with none. I timed myself modeling both ways to see which one was faster. I also downloaded 2 tools to help track my mouse movements. One shows where my mouse has been with a black line and the other tracks the distance in feet that my mouse has traveled. Here’s the model that I choose. It’s a part that has 3 extruded bosses, 3 cuts, 3 fillets, 19 sketch entities and 19 dimensions. The first model I used my typical, everyday SOLIDWORKS shortcuts. These are some hot-keys (i.e. “L” for line & “D” for dimension), mouse gestures, and the shortcut tool bar (“S” key). It took me 226 seconds to model it and my mouse traveled 28 feet. That isn’t too bad as a good base value. Here is what the mouse path graphic looks like. You can see that my mouse really stayed in the middle of my screen right where my model is. I didn’t need to move to the command manager for anything. 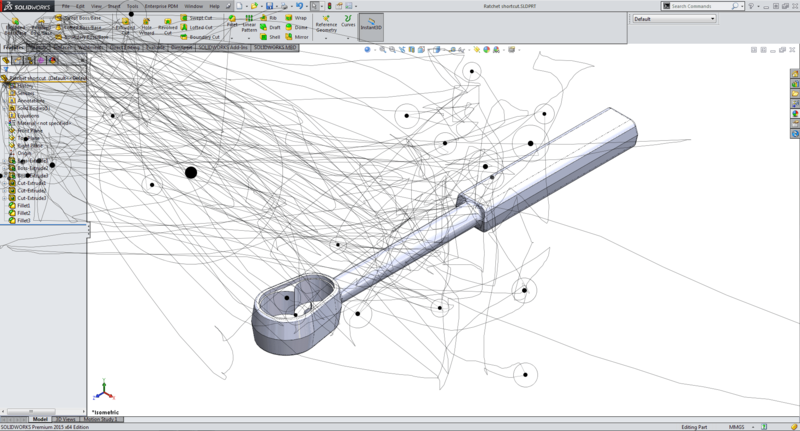 Now let’s look at the one where I didn’t use any SOLIDWORKS shortcuts. I knew that this one would be slower and I would have a lot more mouse movement. It took me 421 seconds to model it and my mouse moved 103 feet. Here is the mouse path graphic. I can say that I modeled this as fast as I think I can. I had to really try to not use any shortcuts. This was harder than I thought it would be. As you can see, my mouse spent more time on the property manager and command manager than in the graphics area. Let’s take a look at the numbers. 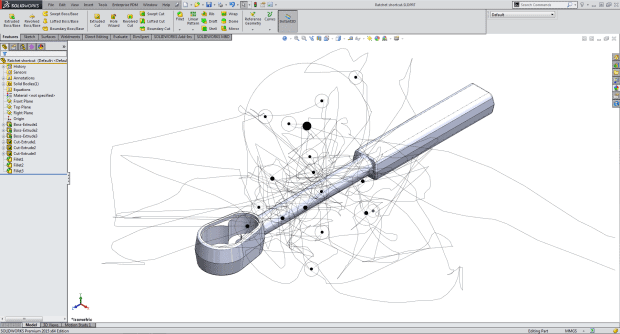 I can see that I had a savings of 46% in time and 73% in mouse movement by using SOLIDWORKS shortcuts. 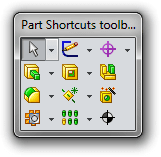 I don’t know of a reason not to use SOLIDWORKS shortcuts. I just proved out the reason for them with sketches and parts. You need to customize your environment to match what you do. So if you do a lot of sheet metal then add the sheet metal tools to the shortcuts or whatever features you use the most. I thought you might be wondering what my “S” key has on it. Here it is for sketches and parts. I also have shortcut keys that I use and mouse gestures. Here are 2 PDFs that have my tools. Again, you need to customize yours to match what you do.